Hammering is an automated trading system which works on any currency pair. Multi-currency and single-currency trading is performed. Making decisions the EA uses signals of the Slope Direction Line indicator. period = 55; - indicator period. FilterNumber = 2; - indicator filter. 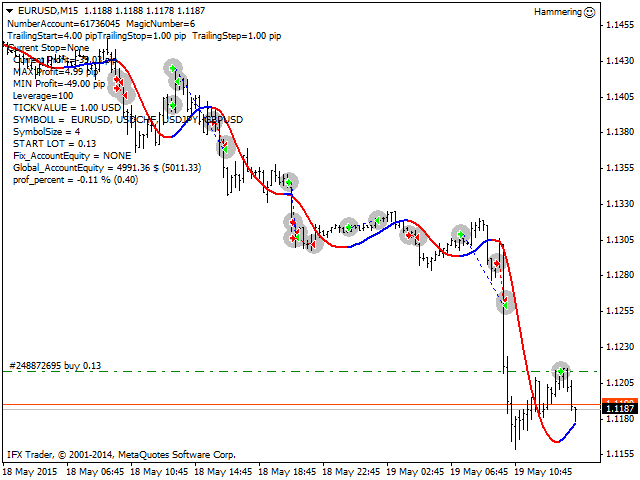 ma_method = 3; - indicator averaging method. applied_price = 0; - price applied to the indicator. TF = 15; - chart period of the indicator. PAIRS = "EURUSD,GBPUSD,USDCHF,USDJPY"; - set of currency pairs for multi-currency trading. TrailingStart = 9.5; - profit level in points. Initial level after which trailing starts, or launches. Risk = 0.3; - risk percentage when trade volume is calculated, valid if Lots=0. PIP_LOCK = 13; - initial position drawdown level at which locking position will be opened, in points. koef_LOT_LOCK = 2; - lot multiplier for locking position. Level_Order = 13; - level from the current price to place a pending order. koef_LOT_AV = 2; - averaging order lot multiplier. MarketWatch = false; - broker's operation mode, if the broker does not allow to place SL and TP along with a position being opened, but by the way of modification only. ALERT = true; - sound alert of exceeding maximum lot. The market is entered if there are signals from the Slope Direction Line indicator. The EA opens an initial position. If the initial position has a drawdown equal to or exceeding the PIP_LOCK parameter in points, a locking position is opened. Locking or averaging positions, which have a drawdown equal to or exceeding the PIP_AV parameter in points, will be averaged by pending BUYSTOP and SELLSTOP orders. Profit is fixed by virtual trailing in points. In case of multi-currency trading, calculation is made by a total number of points of all traded currency pairs. If you want the EA to work in the multi-currency mode, specify comma separated currency pairs, which will be traded by the EA, in the PAIRS setting, for example: PAIRS = EURUSD,GBPUSD,USDCHF,USDJPY. That means that the EA will trade only this 4 currency pairs. At that the EA is attached to ONE !!! currency pair, and all pairs must be opened in the market watch. The EA can trade on several pairs with disabled multi-currency mode. Just specify one currency pair it will trade in the PAIRS setting. For example, you want to trade 4 currency pairs with independent operation of each EA. For this purpose specify EURUSD in the PAIRS setting and set MagicNumber to 1. Then attach the EA only to EURUSD. Do the same for the rest 3 currency pairs setting MagicNumber to different values (= 2, 3, 4 etc.). Thus, you will have 4 Expert Advisors - one per each currency pair. Изменена запись советник в комментарии к ордеру.